M.I.A. 's Flip Of The Finger: Big Deal Or Not? : The Two-Way The singer flipped the bird during the Super Bowl halftime show. It's a gesture that seems to be seen more and more often. Should we be upset that it got on national TV? If it's the morning after a Super Bowl then that must mean everybody's talking not just about the game but about the ads and the halftime show as well. M.I.A. 's now famous finger during halftime of the Super Bowl. The ads? Meh, as the kids might say. It certainly didn't seem to us like there were any true breakouts. According to USA Today's annual Super Bowl ad meter that measures a captive audience's reactions, "dogs are still a Super Bowl advertiser's best friend." No stunner there. The halftime show? Ah, now there's something to debate. We'll let our friends at The Record and Monkey See decide what should be said, if anything, about the quality of Madonna's performance. 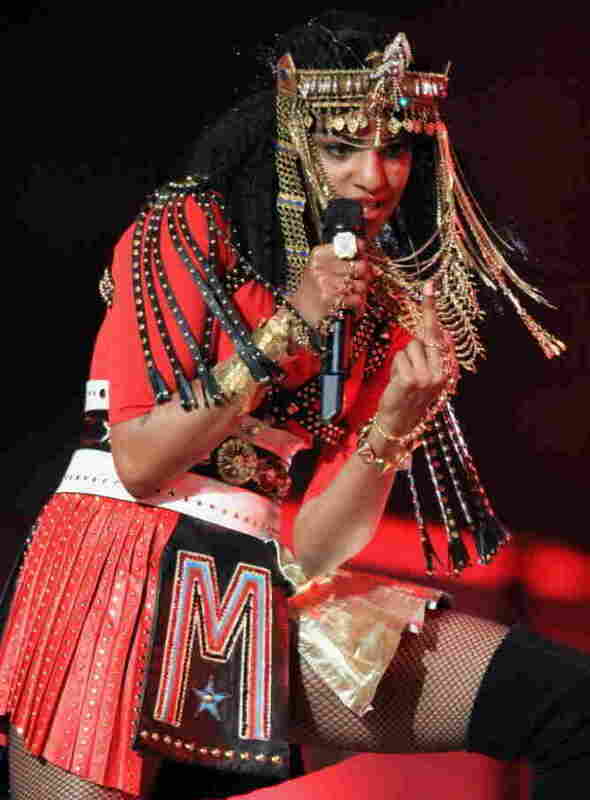 What we're wondering is how upset, or not, everyone is about the middle finger (and possibly said an expletitive) dropped by singer M.I.A. as she backed up Madonna. On the one hand (so to speak), it's an obscene gesture and it theoretically might have been seen by more than 100 million Americans. "On streets, in stores, in schools, on the news. People are extending their middle fingers as a silent, but effective — sometimes too effective — way of saying "go to hell," "up yours" or "(insert nasty-sounding verb here) you." It's also known by a few other handles, such as "shooting the bird" and "flipping off." But whatever you call it, it's become commonplace." So, it might be asked, why fuss over something so common? Politico says M.I.A. 's fleeting finger "could add up to another Super Bowl headache for the Federal Communications Commission," which now must decide whether NBC-TV should be fined for letting it get on the air (the network's attempt to digitally blur the gesture was a second too late). The commission might wait, though, to decide what to do until after the Supreme Court rules on the constitutionality of its "fleeting expletive policy." A lower court has said the FCC was wrong to fine CBS-TV $500,000 for Janet Jackson's "wardrobe malfunction" at the 2004 Super Bowl halftime show. Are you upset or not about M.I.A. 's obscene gesture during halftime of the Super Bowl?